i.sentinel.preproc - Imports and performs atmospheric correction of Sentinel-2 images. i.sentinel.preproc allows to import Sentinel-2 images and perform atmospheric and topographic correction. i.sentinel.preproc is a module for the preprocessing of Sentinel-2 images (Level-1C Single Tile product) which wraps the import, the atmospheric and the topographic correction using respectively i.sentinel.import, i.atcorr and i.topo.corr. It works both with Sentinel-2A and 2B images. The aim is to provide a simplified module which allows importing images, which area downloaded using i.sentinel.download or any other sources, and performing the atmospheric correction avoiding users to provide all the required input parameters manually. In fact, regarding the atmospheric correction performed with i.atcorr one of the most challenging steps, especially for unexperienced users, is the compiling of the control file with all the required parameters to parametrize the 6S (Second Simulation of Satellite Signal in the Solar Spectrum) model on which i.atcorr is based. 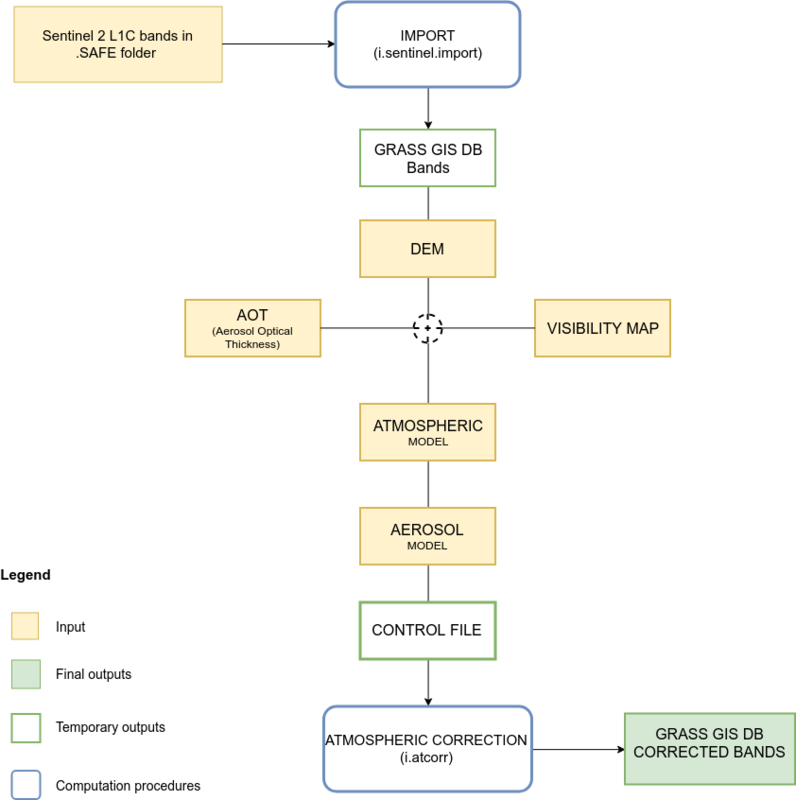 To run i.atcorr, users have to provide the so-called control file in which all the parameters (geometrical conditions, date, time, longitude and latitude of the center of the scene, atmospheric model, aerosol model, visibility or Aerosol Optical Depth -AOD- value, mean elevation target and bands number) have to be specified with precise syntax rules and codes. i.sentinel.preproc retrieves as many parameters as possible from the metadata file (e.g. Geometrical conditions, data and time and bands number), longitude and latitude are automatically computed from the computational region while others like the mean target elevation above sea level from the input digital elevation model (DEM). Only a few parameters have to be provided by users who can choose the proper option from a drop-down menu thus avoiding to enter the corresponding code. In any case, i.sentinel.preproc writes a temporary control file, changing it according to the band number, following the syntax rules and codes of i.atcorr and then it runs i.atcorr for all bands. Using the c flag i.sentinel.preproc is able to perform also the topographic correction using i.topo.corr creating the needed information as the illumination model based on the elevation model provided by the user. When all bands have been processed by the integrated version of i.atcorr, an histogram equalization grayscale color scheme is applied. If the -t flag is set, a text file ready to be used as input for i.sentinel.mask will be created. In this case a name for the output text file has to be specified. NOTE: as for i.atcorr, current region settings are ignored. The region is temporary set to maximum image extent and restored at the end of the process. Important: i.sentinel.preproc requires all the bands of a Sentinel-2 images. If the module is used only for the atmospheric correction, all bands from *_B01 to *_B12 must be imported. Moreover, the original bands name has to be kept unchanged (e.g if the original name is T17SPV_20180315T160021_B02 the imported raster map in the GIS DATABSE must be named T17SPV_20180315T160021_B02). i.sentinel.preproc allows the import of all the bands of a Sentinel-2 image. The required input is the .SAFE folder downloaded using i.sentinel.download or any other source (e.g. Copernicus Open Access Hub). Note that in the case that spatial reference system of input data differs from GRASS location, the input data are reprojected. The number of imported bands can not be reduced, all bands are automatically imported by default. Important: i.sentinel.preproc allows the import of one image at a time because the input .SAFE folder is also used to automatically identify the corresponding metadata file that is used during the atmospheric correction. The import can be skipped using the -i flag. Note that even if the import is skipped the input .SAFE folder must be specified to automatically retrieve the metadata file. rescale = the output range of values for the corrected bands, for example: 0-255, 0-1, 1-10000 (default value 0-1). The module writes the control file automatically starting from the input above. i.atcorr requires a control file to parametrize the 6S algorithm on which it is based. Using i.sentinel.preproc the only parameters from the list above that users have to provide are: atmospheric model, aerosol model, visibility or AOD value. The others are automatically retrieved from the metadata file, input elevation map and bands. The geometrical condition of the satellite are read from the metadata file and converted to the corresponding i.atcorr code, 25 for Sentinel-2A mission and 26 for Sentinel-2B. Date (month and day) and time are read from the metadata file. The date (with the format YYYY-MM-DDTHH:MM:SSZ) is converted in a standard format and only the month and the day are selected and added to the control file. Time is already in Greenwich Mean Time (GMT), as i.atcorr requires, and it's automatically converted to decimal hours. Longitude and latitude are computed from the computational region and converted to WGS84 decimal coordinates. Users can choose the proper option from a drop-down menu. The desired model is automatically converted to the corresponding code and added to the control file. The default option is Automatic which consists in the automatic identification of the proper atmospheric model for the input image. The Automatic option reads the latitude of the center of the computational region and uses it to choose between Midlatitude (15.00 > lat <= 45.00), Tropical (-15.00 > lat <= 15.00) and Subarctic (45.00 > lat <= 60.00) for Northern Hemisphere (obviously it also works for the Southern Hemisphere). Then, the month from the acquisition date is used to distinguish summer or winter in case of Midlatitude or Subarctic model. Once the proper atmospheric model is identified, it is converted to the corresponding code and added to the control file. Note that this is a simplified and standardized method to identify the atmospheric model. Obviously, it is possible to choose other options from those available. Also in this case, only some options are available and users have to select the desired one from the drop-down menu, then it is converted to the corresponding code and added to the control file. No automatic procedure has been implemented in this case. By default, i.sentinel.preproc uses the input visibility map to estimate a visibility value to be added in the control file. If no visibility map is available for the processed scene, it is possible to use an estimated Aerosol Optical Depth (AOD) value checking the -a flag. If the -a flag is checked and a visibility map is provided, the visibility will be ignored and no mean visibility value will be computed and added to the control file. Whereas, if the -a flag isn't checked and an AOD value is provided it will be ignored and not added to the control file. In the same way, if the -a flag is checked and a visibility map is provided it will be excluded from atmospheric correction process. The AOD value can be specified by users (e.g. aod_value=0.07) or automatically retrieved from an AERONET file to be given as input instead of the AOD value. i.sentinel.preproc reads the AERONET file, identify the closest available date to the scene date and compute AOD at 550nm using the closest upper and lower wavelength to 550 (e.g. 500nm and 675nm) and applying the Angstrom coefficient. Then, giving this file as input (e.g. aeronet_file=your_path/*.dubovik), the AOD at 550nm will be automatically computed and added to the control file. NOTE: as in i.atcorr manual explained, if an AOD value is provided a value 0 for the visibility has to be entered with the AOD value in the following line. Obviously, i.sentinel.preproc takes into account this syntax rule and automatically adds a 0 value for visibility (or -1 if AOD=0) if an AOD value is provided (through both aod_value and aeronet_file). Mean target elevation above sea level is automatically estimated from the input digital elevation model. According to the rules for writing the contol file of i.atcorr, the mean elevation value is added as a negative value and converted in kilometers (e.g. if mean=121 in the control file it will be written in [-km], i.e., -0.121). Since the sensor is on board a satellite, the sensor height is automatically set to -1000. The number of the band changes automatically according to the band that is processed at that moment. The module reads the name of the band and converts it into the corresponding code. 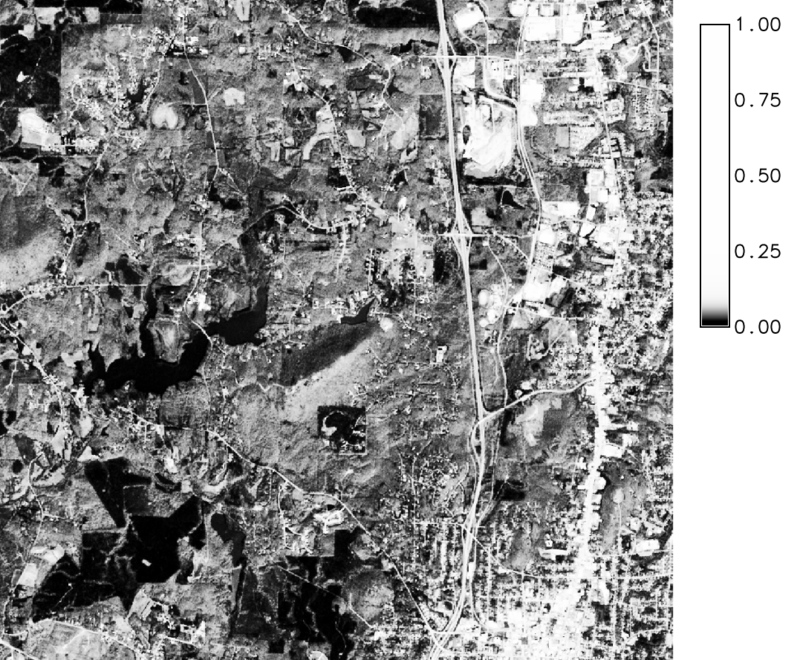 The example illustrates how to run i.sentinel.preproc for a Sentinel-2A image (S2A_MSIL1C_20180315T160021_N0206_R097_T17SPV_20180315T194425.SAFE) in the North Carolina location. The AERONET file has been downloaded from the EPA-Res_Triangle_Pk station. i.sentinel.preproc integrates a simplyfied version of both modules (i.sentinel.import and i.atcorr), only some options are available. For instance, if it's necessary a strong customization (e.g. definition of your own atmospheric or aerosol model), please refer to i.atcorr. i.sentinel.preproc works with Sentinel-2 images whose names follow both the New Compact Naming Convention (e.g. S2A_MSIL1C_20170527T102031_N0205_R065_T32TMQ_20170527T102301.SAFE) and the Old Format Naming Convention (e.g. S2A_OPER_PRD_MSIL1C_PDMC_20160930T155112_R079_V20160930T095022_20160930T095944.SAFE). For further information about the naming convention see ESA Sentinel User Guide.